The issue in my particular case was that I was trying to add a route using the gateway address of a subnet. `ip route` seems to validate that the route you’re adding is the network IP address. You can’t have any of the host IP bits set when you do this. This largely didn’t seem to make any sense. The machine had plenty of free memory, and I didn’t seem to be hitting any ulimit limits. BIRD’s status display was showing ‘Error: Kernel MD5 auth failed’ for all the failing sessions, which wasn’t very helpful. I couldn’t really find any information on this, so I asked on the BIRD users mailing list. I was pointed to https://patchwork.ozlabs.org/patch/138861/ (Linux kernel commit by Eric Dumazet, Jan. 31, 2012, 8:56 p.m., commit hash da5d322), which adds a sysctl setting that restricts the amount of memory available for authenticated TCP sockets. In the end, the fix was just a matter of increasing the net.core.optmem_max sysctl setting. Once I did this, and restarted BIRD, all the sessions came up just fine. 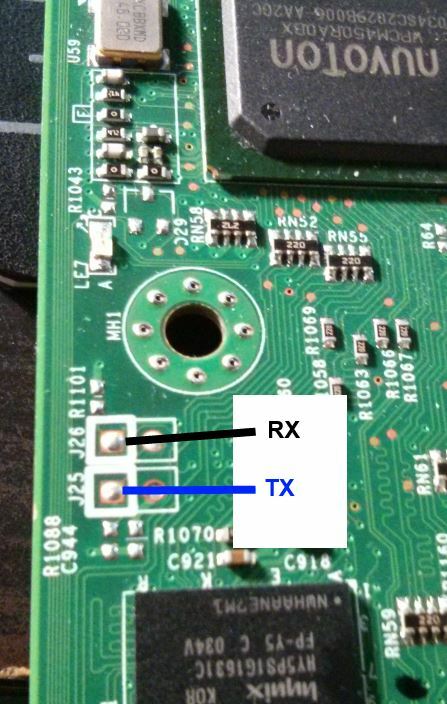 After reading a blog post on it, I went probing around my X8SIL-F board looking for a hidden serial port. After entirely too long, I discovered it’s right near the IPMI controller, and is labeled J25 (TX) and J26 (RX). You’ll need an adapter though, this is a 3.3v serial port. I (badly) soldered some headers on, and am now able to interact with the IPMI controller. WPCM450 Ethernet(eth0) driver has been initialized successfully! [NCSI 1] Discovery all NCSI channels for this Package. 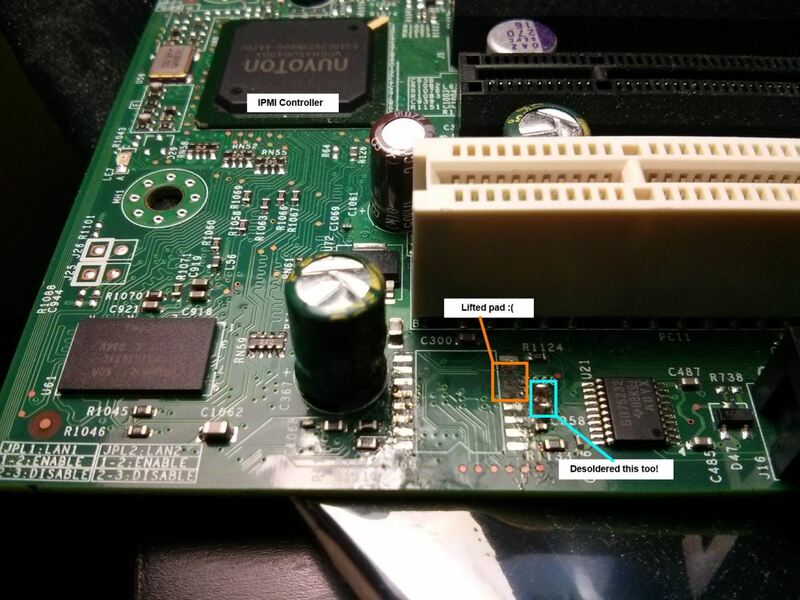 WPCM450 Ethernet(eth1) driver has been initialized successfully! SSL Certificate is not yet valid. Time maybe lost. Verify the ssh key-/nv/dropbear/dropbear_rsa_host_key. Please wait. Verify the ssh key-/nv/dropbear/dropbear_dss_host_key. Please wait. There’s still a lot to do, but this makes debugging new firmware possible, rather then just having to blindly test things. 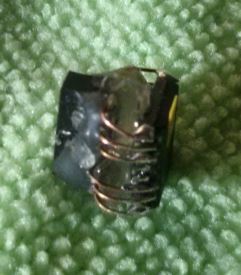 iny little soldering, which is quite annoying to do. I was ultimately successful, though it took a good 6 hours to accomplish. d the wires and the socket to my desk. You don’t actually need to connect all the pins, it’s safe to just connect the outer three on each side. (Look at the datasheet for the pinout). Bend the legs up, reinforce them with hot glue. If you solder somewhat carefully and don’t cover up the pins on the top you can still fit a Pomona clip on top. This makes it easy to program. Solder the ‘emulator’ onto the motherboard. This looks terrible, but works. I needed magnification to find all the tiny solder bridges I created. Program the new memory chip with the standard firmware, attach to header. Moment of truth! Power on the board. If you’ve done everything correctly, the IPMI controler should boot up. The ‘IPMI Health Indicator’ (that green circle in the previous image) should start flashing, and the controller should pull a DHCP leasse. 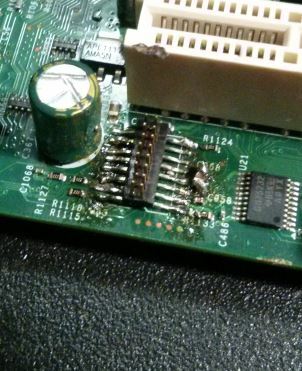 If your controller doesn’t work, make sure you haven’t created any solder bridges. Also make sure that everything is properly attached. After all this, I now have the ability to flash whatever firmware I want and not have to worry about bricking the controller. I can just remove the chip and reflash it if something doesn’t work. Ultimately, I’m hoping to find a hidden serial port (the bootloader and kernel are both configured to output things on a serial port, I just don’t know where it is) which would let me program things in circut. It’s just about become time where I move onto actually replacing the IPMI controller firmware. Up until now, I’ve been pretty worried about attempting it. Since there’s no in circut programming, a failed flash would involve removing the chip to reprogram it. 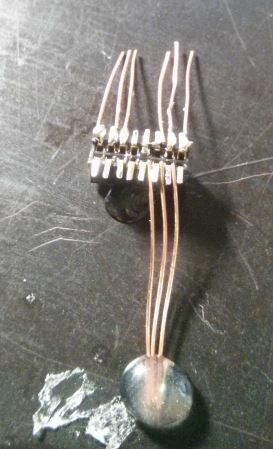 I managed to track down something I could solder in place of it to make this process easier. It’s called a SOIC Emulator, and it’s surprisngly expensive (given it’s a couple bits of metal and plastic). I bought the ‘PA-DSO-1603-D420-16/2’ product, since it should fit in place of the existing flash chip (a MX25L12845EMI-10G). 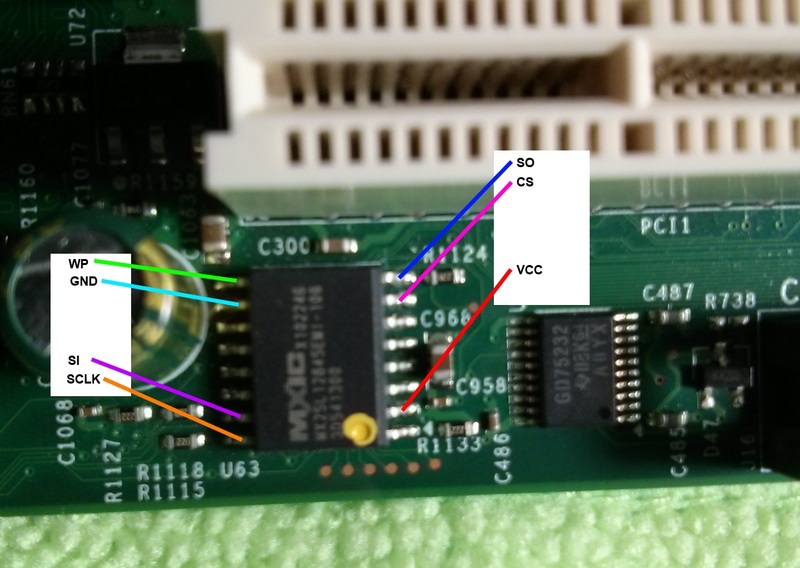 I also labeled the pinout. This isn’t terribly helpful though, the board is designed in such a way that you can’t program it without removing it. Flashrom does detect this, so that’s a start. Step two is the scary one. 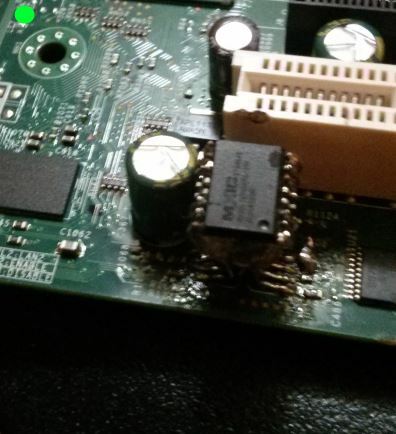 You have to desolder a surface mount chip that has very little clearance. I don’t do a whole lot of soldering (and no SMT soldering), so I don’t have any of the tools that would make this process easy. Instead, I tried to do it with a Sparkfun soldering iron, some desoldering wick, and a razor blade. This worked okay, but I ended up lifting a couple solder pads. Luckily, these weren’t terribly important. Two of them aren’t used here (they’re for parallel data in/out, but this is used in serial mode). The third is chip select; but there’s only one chip so I can just connect it to VCC/GND (I forget which right now). It’s not pretty, but it did the job (hopefully!). Now I just need to wait until I get the replacement parts. 10 Nov 2012 » PING Transmit Failed. General Failure.